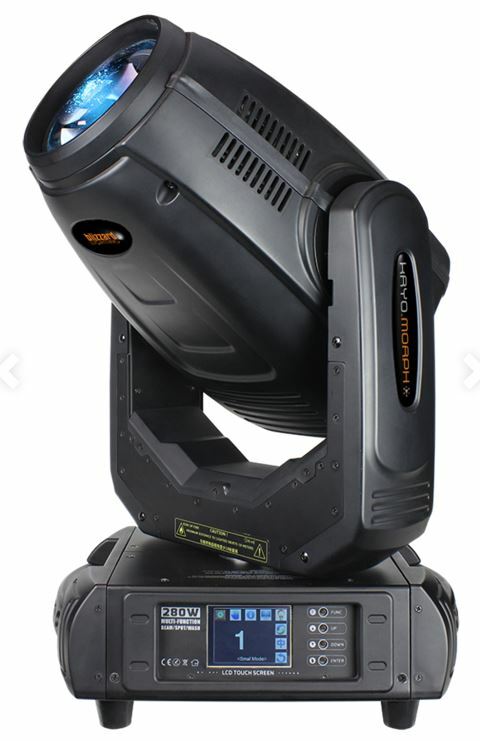 Introducing the Kryo Morph™, our super-bright and feature packed beam/wash/spot moving head light that is built to impress with its incredible shape-shifting beam effects that can cut through the air with ease! It can project a static or rotating glass gobo to produce precision in-air and surface images with an even focal plane. With a narrow 5°-20° (spot application), or 2.5°-10° (beam application), the output is crystal clear and brilliant. Add in either rotating 6-way linear or 8-way circular prisms to create wide reaching effects across any stage. Use the frost filter and any of its 13 rich colors to create a very smooth even wash. The Kryo.Morph™ has an output far greater in quality and power than seems possible from fixture of this size, due to its highly efficient short arc 280W discharge light source and precise optical configuration. Features include 540/270° pan & tilt movement, 9 rotating gobos, 14 static gobos + open, 13 colors + white, 6/8-facet rotating prism, motorized zoom and focus, frost filter, 4-button + touch screen LCD control panel, PowerCON® compatible power input, and dual ¼ turn omega mounting brackets.